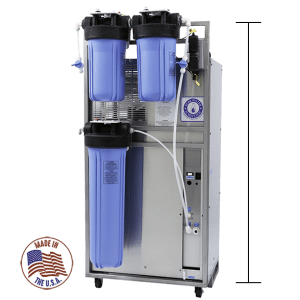 The Mega Classic is an Automatic Water Distiller that can produce up to 12 Gallons of distilled water and boasts a 10-gallon storage tank. Stand Optional. If you desire the ultimate in convenience and faster production, the Mega Classic Automatic Water Distiller is perfect for you! 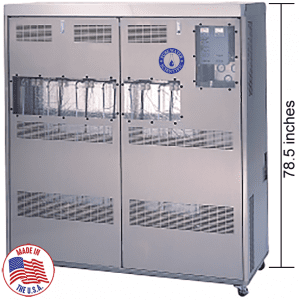 It produces up to 12 gallons of distilled water per day and is equipped with a large 10 gallon storage tank. 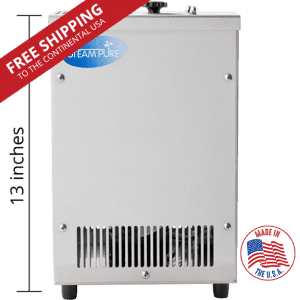 It has a built-in demand pump to deliver pure water right to your sink and refrigerator or has a manual distilled water outlet for dispensing water directly from the storage tank. Maintenance is minimal with the Mega Classic’s self flushing feature. 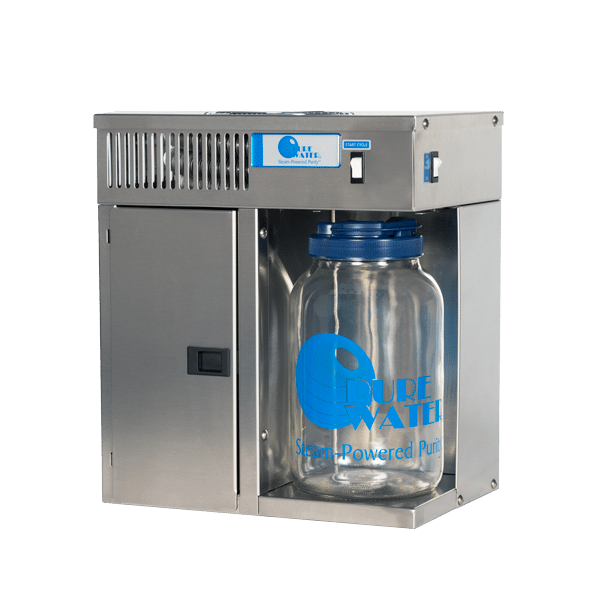 This unit is the perfect home water distiller as it produces and stores the right amount of water for medium to large sized families. It is also an option for smaller offices. 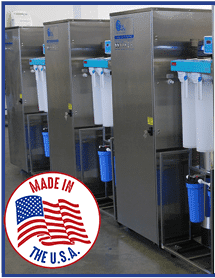 If you need assistance choosing the right distiller for your needs, please feel free to call us at 1-800-875-5915 or email us at info@mypurewater.com. 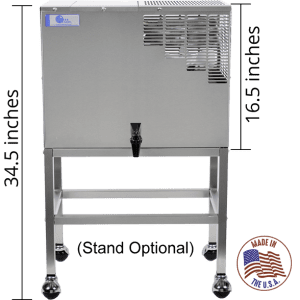 The Mega Classic Automatic Water Distiller is constructed of top-quality stainless steel to provide years of dependable service with little care. 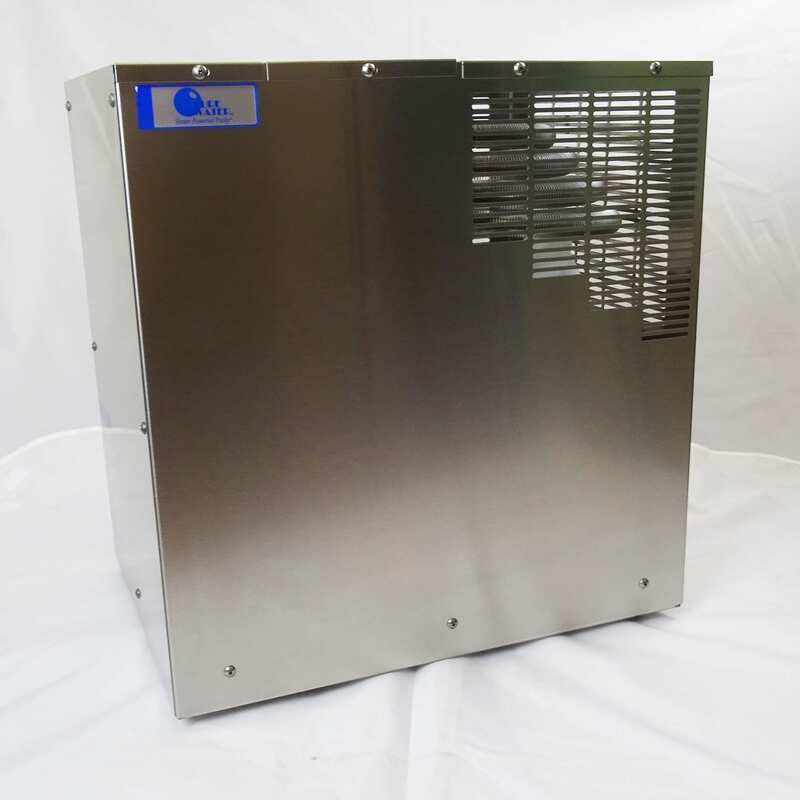 It is fan-cooled and has a unique float design to stop automatically when the storage tank is full. It has a safety shut-off switch which turns the unit off should it ever overheat. 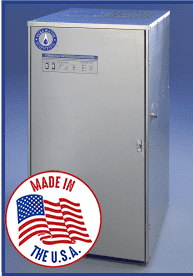 Each Pure Water distiller is complete with twin vents to allow volatile gases to escape. Additionally, a carbon post filter is included to aid in the removal of any organic or inorganic gas carryover and to improve taste. The Mega-Classic will automatically flush and drain the contaminants from the boiling chamber when the storage tank is full. This maintenance reducing feature requires that this unit be installed near a drain. For installations that cannot accommodate a drain, the unit can be switched to manual drain mode with a push of a button. 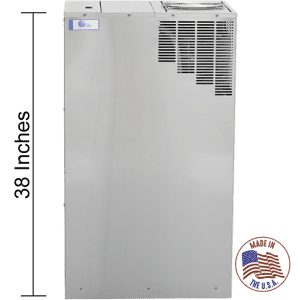 The Mega Classic also has a built-in demand pump to deliver the distilled water to an auxiliary faucet and/or to a refrigerator or ice-maker. You can also add an optional faucet to dispense distilled water directly from the storage tank. 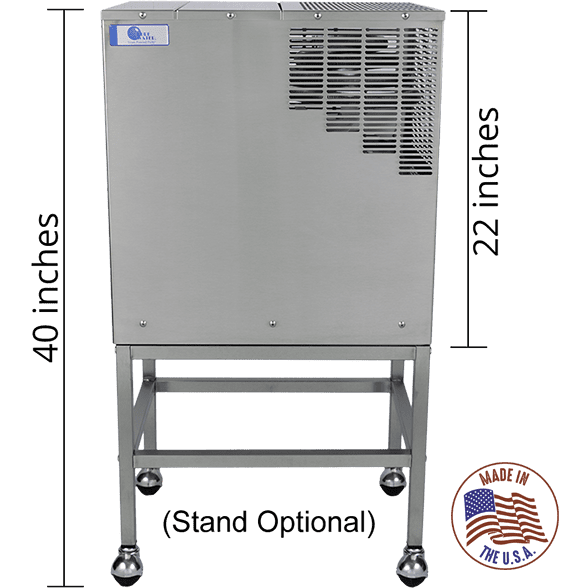 Pure Water has an optional stainless steel floor stand available for easy installation of your Mega Classic in your basement or utility room. 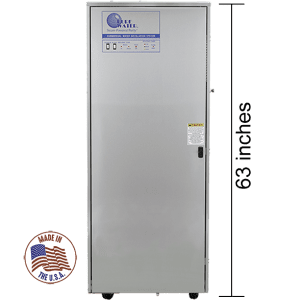 Just as Mother Nature takes ocean water and makes pure, rainwater, a Pure Water automatic water distiller duplicates the Hydrologic Cycle inside this appliance. Regular tap water or softened water is received into the boiling tank. A fan cools the steam and it becomes pure, distilled water. A stainless steel storage tank holds up to ten gallons of distilled drinking water. 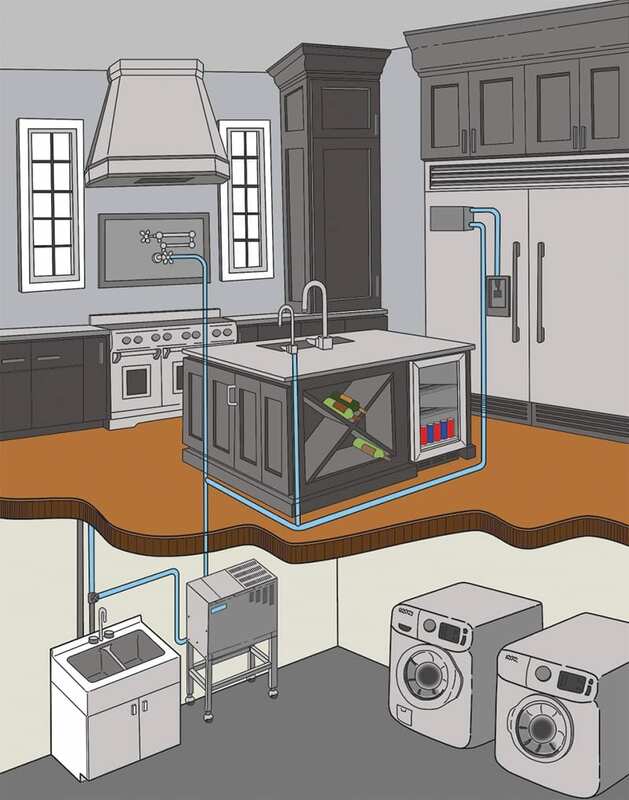 A demand pump delivers the distilled water to a remote faucet, refrigerator and/or icemaker. 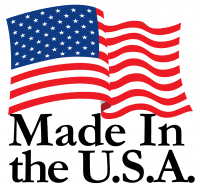 I come from a family of mechanical / electrical engineers all of whom understand a well thought out design and high quality craftsmanship, of which I reiterate your product showcases with ease by its unrelenting level of consistency and performance throughout the years! We have had the benefits of pure water all of these years and frankly I cannot imagine drinking anything else when I have the choice. No other filtered water or other brand names can compare to the pureness and quality of the water produced by the Mega Classic.